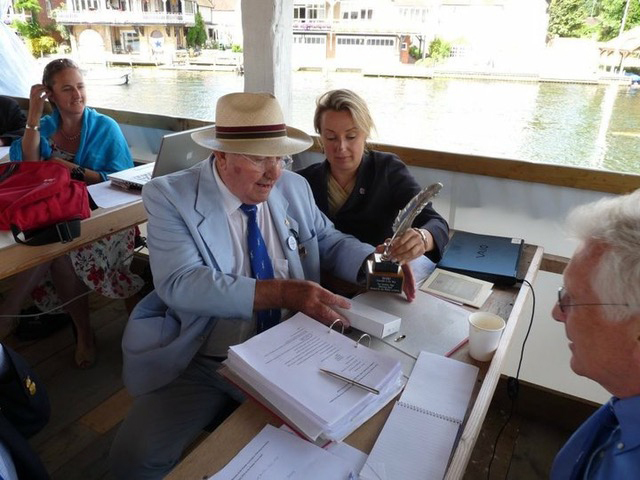 John Shore with the Geoffrey Page Memorial Quill at a BARJ AGM in the press box at HRR. Photograph courtesy of Liz Wray. Obituary writer Chris Dodd on the right. Photographer John Shore passed away on 29 January 2019, at age 85. Chris Dodd writes about his friend, who occasionally did the specialist photographer’s bête noire – if he liked you and you asked nicely. John Shore was a prolific photographer of rowing, diligent picture editor of Regatta magazine and the first treasurer of the British Association of Rowing Journalists (BARJ). He took up serious photography when his sons Ian and Neville began rowing at Weybridge and was soon developing monochromes in his attic dark room and selling them, initially at cost price, at regattas. At that time, he had the field almost to himself, covering many Boat Races, head races, Henleys and international events. He claimed to have been the only photographer in attendance at the first Henley Women’s Regatta. In 1976 at the Junior World Championships in Villach, John thought he would get better pictures from a launch which seemed to be shadowing the umpire’s launch, so he asked the chap in the back if he could come for a ride. The chap turned out to be Thomi Keller, the president of FISA (now World Rowing), and John spent the rest of the champs taking close-ups while turning a chance meetings into a lasting friendship. During his time as social secretary of Weybridge Rowing Club, John and another member re-laid the floor of the clubroom with vinyl tiles so that it resembled a chess board where members could challenge visiting rowers to beer draughts. The annual Spreadbury Cup awarded to the person who has done most during the year was presented to him in 1975. 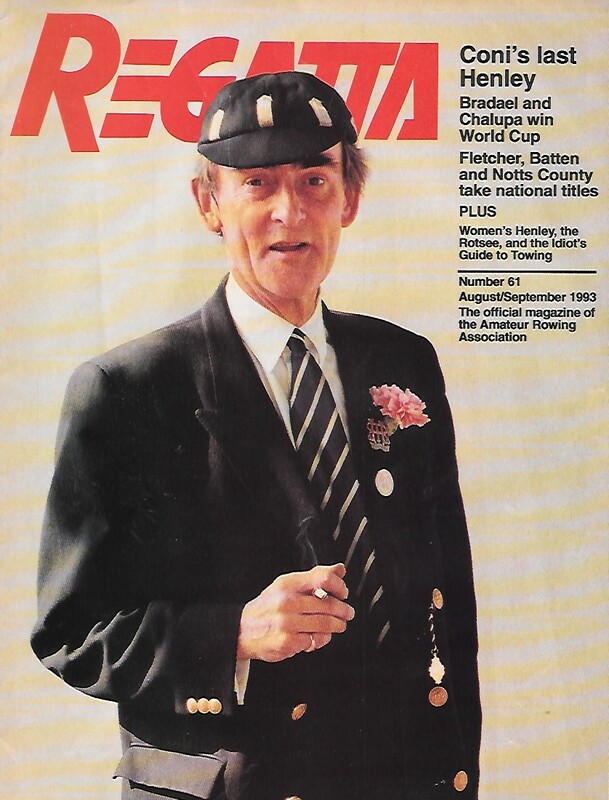 John, who died on 29 January, aged 85, was the obvious choice as picture editor for Regatta when the magazine first appeared in 1987. He held the post until 2005, moving into colour and doing much of his best work. He shot dozens of cover pictures during his occupancy, an early example being the Avon Gorge Head shot from somewhere above Clifton Suspension Bridge. He consistently looked for new angles in a discipline that is notoriously difficult. 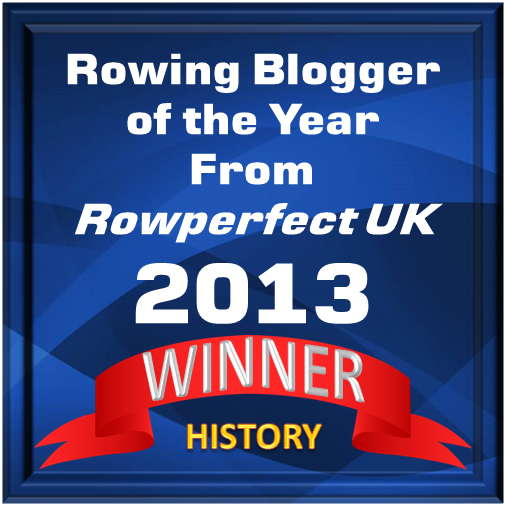 On more than one occasion, he covered the Boat Race from a perch on the notorious Black Buoy at Putney. He also wrote feature articles for Regatta, once reporting from Canada on the great Ned Hanlan, the first sculler to conquer the sliding seat. He wrote excellent spectators’ guides to Henley and the Boat Race, including tips for photographers. He was a team player, always willing to help. “Regatta” magazine No. 61 August/September 1993 – Peter Coni at Henley 1993. Photo: John Shore. The photograph that earned John the most money was the semi-final of the Queen Mother Cup between Kingston and Maidenhead at Henley in 1983. It was used on the cover of Country Life and subsequently in other magazines and calendars. A doctor who attended John at his home a few days before he passed away saw the picture on the wall and recognised the umpire as John Stephenson, his father. John Henry Shore was born in 1933 to Grace Amelia and George Gordon Oswaldiston Shore, who was employed by a Fleet Street newspaper. He was educated at Edmonton Grammar School and joined the RAF for National Service, serving in Libya and the Middle East. After National Service, he joined British European Airways which merged with BOAC in 1974 to form British Airways. He married Grace Barnes in 1956, and his career with BA transported him from the cargo division to superintendent of Terminal One at Heathrow. He took early retirement in 1987 to spend more time taking pictures. The captain of the early morning Trident to Helsinki was handed four stretchers and told that he was personally responsible for delivering them on touch-down. The crew missed only one outing. John was an ardent treasurer of BARJ, running a tight ship and sometimes argued a stubborn corner. As chairman, I sometimes complained that if you gave him a stick, he would inevitably grasp the wrong end of it. But he served the association well. When interest rates fell, he took the unilateral decision to invest in premium bonds rather than have BARJ cash languishing in moribund bank accounts. He was often criticised for this and at the AGM always took great pleasure in reporting the extent of the winnings his actions generated. For many years, BARJ held an awards dinner at the River & Rowing Museum during Henley week for which Camelot picked up the tab. Mike Haggerty, the secretary, recalls that when Camelot pulled the plug on their sponsorship, the executive decided to impose a modest charge on those attending and to dip into John’s reserves if required. At the AGM a few days later, John had hysterics when, during the delivery of his financial report, he suddenly realised that a combination of members contributions and the recruitment of new sponsors – Aberdeen Asset Management and the Parker Pen company – had enabled BARJ to run a dinner at a profit… sorry, surplus’. The treasurer produced various bits of BARJ-branded kit, including some really dodgy baseball caps, some of which are still to be seen. The association presented him with a lifetime achievement award in 2005. He was also great company, always up for a quick chat on the towpath or with an umpire at the start line while waiting to press the shutter. He conducted an ongoing correspondence with Haggerty about how Mike lived in the land of milk and honey (aka Scotland), enjoying free home care, free tuition, free prescriptions, etc, thanks to subsidy provided by its neighbour to the south. He was a member of Leander and the Stewards Enclosure until about three years ago when he felt unable to attend Henley any longer. John would occasionally do the specialist photographer’s bête noire – wedding pictures, but only for people he liked who asked him nicely. He once fell into the river at Remenham Club whilst taking a wedding picture. The incident was captured on video and shown on TV, to his horror. Stan Collingwood caught John perfectly on Facebook: ‘A great servant to the sport. A good friend and great company in the bar and press room when racing was over. Happy days picking pictures with him to go with copy [for the old Rowing magazine]. And many a free photo for local newspaper columns. Happy memories’. Ian Shore says that the overall message in the cards, emails, social media and letters received by the family is that his Dad was A Good Bloke. The Good Bloke is survived by Grace, his sons Ian and Neville, daughter Diane and eight grandchildren. John Shore, born 10 May 1933, died 29 January 2019. John told me an amusing tale that Ron Needs asked him if he would attend at the Royal Automobile Club, as official photographer, a Fiftieth Anniversary gathering of Ron’s old National Service comrades from the Royal Corp of Signals. John agreed , duly turned up and. when and where approprite, snapped away, looking forward to selling some of the pics as mementoes to the assembled company, when some vaguely familiar face came up proffering a camera and asked John “if he wouldn’t mind awfully but would he take a couple of photo’s with my camera, please”. John, a little put out at this amateur’s request, agreed. Snapped away and handed back the camera. It was only as the chap departed he realised who the familiar face was. Sir Geofrey Howe, former Chancellor of the Exchequer, Foreign Secretary , Bette Noire of Margaret Thatcher and keen amateur snapper himself.